This morning my beloved uncle Bob died of cancer. He passed away gently, in his sleep. Yet another casualty of the cancer epidemic that is sweeping this planet. He contracted cancer from exposure to asbestos at a pulp mill he worked in. For much of his life, Bob was an inventor, and when he left this earth, he had well over a hundred patents in his name. Most of them were in the field of pollution control. My brother Randy also died of cancer, just a few years ago. Too many of us, far too many of us have been touched by cancers cruel fingers. Although it is often difficult to prove, I believe that the huge spike in cancer we are experiencing is caused by a toxic environment, toxic products and toxic foods. We are suffering from the long term effects of a planet and a people that have been disregarded and disrespected, by those bent on profit and plunder. Uncle Bob, despite being in the final stages of his illness, travelled to Los Angeles to testify at a hearing, suing the company, because he learned that asbestos is still being used, and workers are still being exposed, that unless it becomes too costly for them, these conscienseless corporations will do nothing. One day, I dream of a world of integral business, where all factors are considered in the production, and consumption, of any product, or service. Where we think of the environmental effects, the human effects, the ethical effects, the spiritual effects of each and every enterprise. Where nothing is left out. Where we consider the future – seven generations into the future. I dare to dream of this world, for it is in the dreaming that the reality will emerge. Uncle Bob, though a chemical engineer, a rational guy, had a real spark, a great sense of humour, a talent as a painter, and a whimsical ability to dream. His final dream, which seemed impossible, and unlikely, as he grew weaker and weaker, was to see the fabled Sandhill Cranes of New Mexico. He would often talk about doing the journey but it seemed unlikely. But he did, he pulled it off. One last dream. He was witness to a huge flock of the vast birds, rising from a lake as the sun set, a majestic sight of awe inspiring liberation. And then he joked, “okay, I can die now.” And not too much later, he did. Now, he is at peace. Uncle Bob didn’t wake up this morning, but we did. The least we could is celebrate this life, open our hearts, and see how we can make this world a better place. Let us wake up not only physically, but spiritually. Every moment is precious, so very precious. We always think that death is something that always comes to other people, but one day, we will not wake up. So now is the time, the time is now. Wake up! But is the purpose of life then to be in the moment? No! Just as the purpose of life is not to breathe. But if we stop breathing, we die. And if we are not present, well – we’re just not here. We’re missing out on all the gifts – the boons and the challenges. Which, of course, are often the greatest gifts of all. So we need to fully show up. And then what? Ah the big question. Well it’s different for each and everyone of us, but the first thing to do is to really look within, and ask yourself – am I squeezing the juice from this luscious fruit called life? Of course, many of us feel like we just keep getting handed a plate of lemons. In which case, the saying goes, make lemonade. What are you here to do? Are you using this precious human born life to it’s utmost potential? Dare you ask that question? Let me suggest if you don’t ask that question, and ask that question every day, one day, you’ll be dead, And at that point do you think you are going to say: geez, wish I had of watched another thousand hours of television programming? Or are you suddenly wake up to the realization – holy crap, I just missed my life! The wonderful, amazing, expressive, activist artist Rha Goddess, who we interviewed yesterday for Redvolution, says that when she dies she wants her tombstone to read “DONE” – D. O. N. E.
In other words, she wants to reach the end of her road secure in the knowledge that she did everything she is here to do. That she stepped fully into her power. That she rocked the house. That she shined her light. That she stepped up, stepped out and truly loved. That she awakened to who she truly is. There are no excuses to be made for missing the boat, really – we all have the potential within us, we are all Buddha’s to be. But we need to honour that seed within us if it is to flower. So an essential part of awakening to our full potential is to truly love ourselves. Yep, I know, easier said than done. Here in the west, we have an epidemic of low self esteem. All of us have to struggle with it. I know I do! It shows up in different areas of my life, at times, but when I shine a light deep into my unconscious, deep into that shadow zone, I can see a gaping hole where true self love should be. It’s an ongoing process, and I am getting better at it. Note to self: self love is not about arrogance! Don’t confuse the two! A key distinction. In fact, self love is deeply humble, for you see all your spots, dots and warts, and still love them. Let go of any notion of perfection. Awakening does not mean suddenly becoming perfect. No, it means actually embracing your imperfections, forgiving yourself, and allowing yourself the room to grow. Awakening is a process, not an end point. There is no end point. But there is an aspiration – not a goal – but an aspiration, to fully grow into your potential. Which, like a rainbow in a field, will always move away just before you reach it. You don’t need to literally reach that rainbow, but you can keep your sights on it, and recognize that it is always there. Friends can help! And you can help your friends. Parents, you can help your children – let them know how much you love them, how proud you are of them. Not for anything they do, not for anything they achieve, no that kind of validation, while temporarily thrilling, doesn’t actually mean much. True love is about just being loved for who your are, not for what you do. Strangely enough, coming from that place of self love, of recognizing that you are not what you do, frees you up to truly “do” from an authentic place. You don’t “do” out of a need for validation, or to be loved. Whoa, that’s a big one for me. As a child who was bullied in high school, one of my shadow motivations for all my work is that need for validation. And yet, when it comes, it’s hard for me to actually accept it, because deep down inside, I had been taught by the bullies that I was nobody. I was no good. So there is a two fold challenge for me – let go of the need for validation, but accept it when it comes, embrace it, not because I need any proof that I’m a good person, but because I am a good person, that my true motivation springs from Love, and I deserve to be loved. We all deserve to be loved. Each of us has our own issues to work through, our own ways to learn to love ourselves. One simple excercise is to stand in front of a mirror, look at yourself, for five minutes, thinking only positive thoughts about yourself. Forget about all the buddhist teachings about trascending the ego – for now. Just let yourself be loved. If you want to add an extra challenge to teaching, when you do think a negative thought about yourself, start over. Sheeesh, some of us could be there for hours! So, you’ve done the work, you love yourself. Or at least your working on it! Now, how to find your true life’s purpose, how to figure out what your here to do? Rha Goddess suggests that you start by going within – really look within. Throw out all the programs – all the advice from society, culture, all the people who have a different agenda from you. Let all that go! Your truth needs to come from deep within. You can look at the things that come naturally to you – what is it that you do that gives you joy, where time flies, where you don’t have to force or push? What are the things that people are coming to you to ask you to do? If you don’t know, ask your friends and loved ones – people you trust, but really ask them to set their own agendas aside. Be aware that this is sometimes difficult for people to do. But with love, the people in our lives can often can see our gifts, even if we can’t see them ourselves. Then you need to look at how your gifts can be of service. To truly be effective as a life’s purpose, there needs to be an element of true service to your gift. How can your natural gifts be put into service? That’s key to a fulfilling life. Without service, service that simulatenously serves ourselves and others (people, other species or the planet), we will not have true meaning in our lives. Finally, Rha says, decide to do it! Make the change, take the risk – now. There is no time to lose. Start the process, it may be baby steps at first, but start the process. Don’t procrastinate. Find out just what it is you are here to do, and do it! Unwrap your gifts, step up to the plate and shine. Because you’re needed now, you are truly needed now. one little heart can hold? See how your day is transformed when you flash yourself awake, before you act. The next time the phone rings, take a breath, and ask yourself: how would Love answer? Then, let Love answer, no matter who is calling. Love always knows what to say. What would Love say to the people you meet today: to your family, your friends, to the dog, the bird, the people on the street? The guy who drives you crazy at work? The beggar on the corner? Love is not guilty or dogmatic. Love knows what to do. Love is not a wimp. Love stands up for justice, for truth, for dignity, and sometimes that means being Fierce. 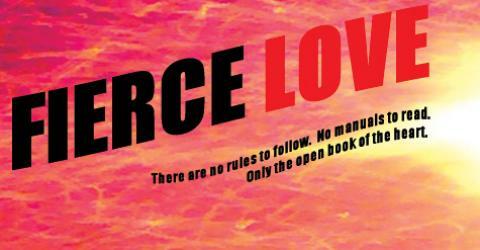 Fierce Love, Fierce Compassion, Fierce Gentleness. Fierce Sensitivity. Don’t insult Love with a hallmark imitation. We’re talking about the real deal here. Love is able to remain loving, unconditionally, in every circumstance, without exception. That’s fierce. Sound like too much work to be Love all day? Then wait until it’s really needed-the moment irritation or anger or fear arises. Stop for a moment before you respond. Look at what it is that’s really triggering you. Can you approach this problem with freshness, with aliveness, as it is, not with a big bundle of pre-conceptions that stops you from seeing the other as a real human being, someone who suffers and dreams, just like you? Before you respond to anyone or anything, ask yourself: what would Love do? Awaken yourself to Love-in a flash.